ULTRA Brasil unveils the first set of names for its second edition, set to take place on October 12, 13 & 14, 2017 — now an expanded three-day affair. 2016’s debut SOLD OUT event saw over 60,000 fans crowd the legendary Sambódromo in the heart of Rio de Janeiro. 2017 is expected to exceed that number considerably, with extended venue capacity. Trance heavyweight Armin van Buuren announced his performance via the Ultra Music Festival 2017 livestream at the end of March. David Guetta and Alesso have also been added to take on Rio this October. These two will ignite the Main Stage, bringing their globally charting hits and highly energetic stage presence to South America’s most beautiful metropolitan city. On the RESISTANCE front, Hot Creations head honcho Jamie Jones will perform alongside recently reunited Sasha & John Digweed, Drumcode techno curator Adam Beyer, Italian mainstay Joseph Capriati and The Martinez Brothers. More names will be revealed soon. Ultra Brasil has also announced unique travel packages featuring bundled flights, hotel deals and in-festival transportation. More information regarding travel packages will be announced May 9, 2017. Furthermore, cashless funding will return for the 2017 edition, giving festivalgoers the option of ditching their credit cards in exchange for designated cashless cards. As an upgraded convenience, attendees will be able to preload funds onto their cashless account in advance to save time at the festival. Cashless funding will be available from May 9 until October 10, 2017. Ultranauts will be pleased to know that ULTRA Worldwide’s global customer loyalty program, ULTRA Passport, has now been launched in Brasil. ULTRA Passport holders can accrue points to progress their passport level for further festivals. In the rapidly expanding ULTRA Worldwide calendar, ULTRA Brasil will mark the final festival of 2017, after crossing through multiple locations across South America the previous week. 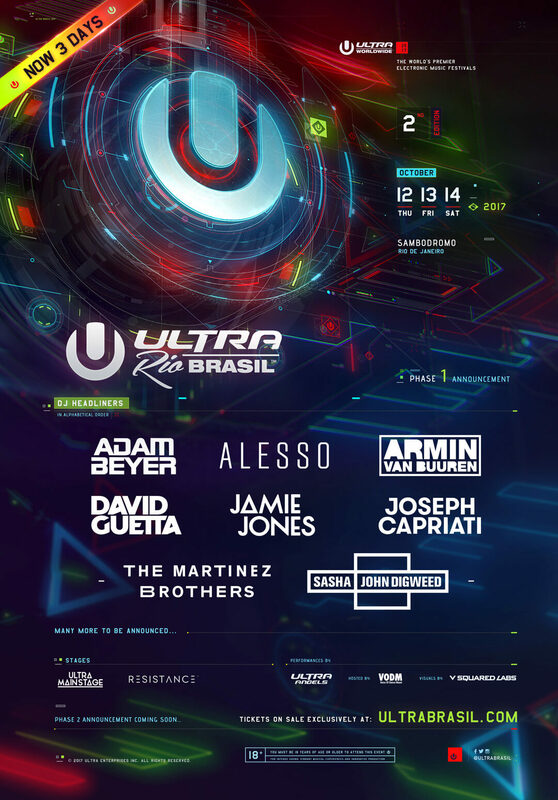 For more information about ULTRA Brasil and all other ULTRA Worldwide events, stay tuned to UltraBrasil.com and UMFWorldwide.com. Tier 2 3-Day General Admission tickets are on sale now for R$ 474.00 (half-priced tickets, available exclusively to Brazilian citizens*) and R$ 948.00 for other citizenships. Single-day tickets are now available as well for R$ 198.00* and R$ 396.00. These tickets will be in very limited supply and will only be available at UltraBrasil.com/tickets. *Brasilian law stipulates certain members of society are granted half-priced tickets to events. Half-priced tickets are only available to Brazilian citizens who fall under one of the following categories: (i) under the age of 21; (ii) a teacher; (iii) a student; (iv) over the age of 59; (v) the disabled.